Baked cheese stuffed ravioli served with a creamy buffalo chicken dipping sauce made with Campbells® Cream of Chicken Soup. hot pepper sauce	 4 tbsp. ground red pepper	 0 1/2 tsp. 1. 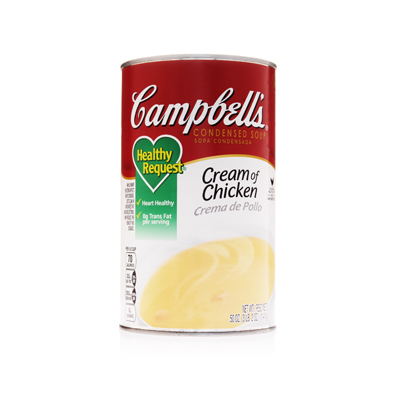 In a large sauce pan, heat Campbells® Cream of Chicken Soup and water over medium heat. Bring to a simmer. Mix until smooth. 2. Stir in half & half, pepper sauce and ground red pepper. Return to a simmer. 3. Stir in pepper Jack cheese. Mix until smooth and heated through. Reserve. 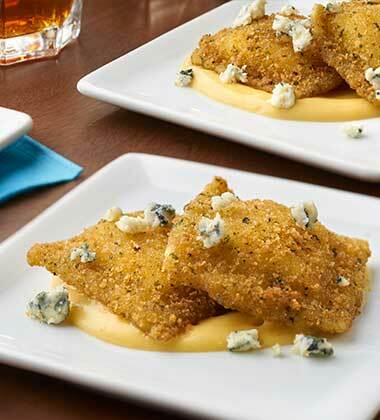 ligtly breaded toasted ravioli	 80 ea. 4. Bake frozen ravioli according to package directions. Reserve. 5. To Serve: Using a 2 oz. ladle, portion, 1/4 cup Buffalo Chicken sauce into the bottom of a small oven-to-table dish. Top with 2 crispy ravioli. Using a #30 scoop sprinkle with 2 Tbsp. crumble blue cheese. Serve immediately.